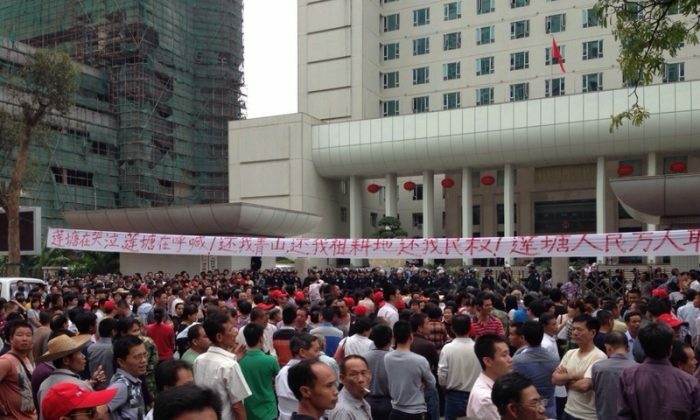 On Oct. 21, thousands of people in Guangdong Province protested in front of the government buildings, in an ongoing dispute over the sale of village lands by officials who pocketed the payments. The angry villagers from Lin Tong village in the Shantou region demanded a resolution to the problem of the illegal land sale of land, and a meeting with provincial land division officials. Village officials had shut down local bus lines to prevent the protesters from traveling to the official headquarters for the protest, but villagers hired their own buses. But the local officials put pressure on the drivers, so the drivers did not dare to come. Lacking other transportation, thousands of citizens walked the ten kilometers (6.2 miles) to the protest, and motorcyclists also shuttled villagers to the protest site. The first protesters to arrive were arrested. Villagers waved signs with signatures of aggrieved citizens and banners demanding to see the Communist Party secretary over the sale of farm land that had been in the family for generations. The dispute has dragged on since last October when corrupt officials sold collectively-owned village land worth over $164,134,000.00 (1 billion yuan). Residents said that the officials secretly sold or transferred ownership of mountain property, beaches, and farmland, forged villagers’ signatures, and secretly signed a contract for logging forest land. Villagers found that a luxury development was planned for the land. The villagers were promised by the Communist Party officials that an investigation would be launched into the fraudulent sales, with no results. In December 2012 the villagers filed a protest petition to the Shantou municipal government, but that petition has not been addressed either. According to the village residents, they are left in limbo, not knowing who owns their land, as they watch developers leveling property for future development, while they are prevented from farming the land which used to be theirs.